The members of the film collective CultJam Productions released the short film, Ivy League Exorcist: The Bobby Jindal Story, on its website (www.cultjampro.com) on July 17, 2012. The film is a dramatization of the bizarre events that took place in a Brown University classroom in 1990. Jindal and members of a student Christian group were holding a prayer vigil for a fellow member who had been diagnosed with skin cancer when the afflicted woman suddenly collapsed on the floor, convulsed, and showed sudden and drastic personality changes that Jindal and the other students interpreted as demonic possession. The group performed a makeshift exorcism on the woman. This is an version of the Jack T. Chick tract parody created during the summer of 2012 to promote CultJam Productions' online short film Ivy League Exorcist: The Bobby Jindal Story (which can be viewed here). Ivy League Exorcist is an absurdist deadpan comedy that lampoons the actual exorcism that Louisiana governor and 2016 presidential candidate Bobby Jindal performed as a Brown University undergraduate. Richard von Busack of Metro Silicon Valley called the film "a sharp shocker . . . worthy of John Waters." The film has also been covered in the London Daily Telegraph, the Huffington Post, Boing Boing, Wonkette, and the Louisiana media. Here is a list of media outlets that covered us. Bobby Jindal's people were less impressed; Governor Jindal's spokesman called the film "insane" and "absurd." This is the revised Summer 2012 version of the tract which was created to promote the film when Bobby Jindal was being strongly considered as a running mate by presumptive presidential candidate Mitt Romney. An updated version was created for the 2016 presidential race (there's also a version created for Chick tract fans). Also, check out our online mini-comic lampooning Scientology. In addition, there's a 2016 Chick tract parody "Trump Is The Antichrist" that pokes fun at both Donald Trump and Marco Rubio. More updates and links after the tract. Also check out CultJam Productions' blog. JUNE 2013 UPDATE: Welcome Boing Boing readers; Cory Doctorow mentioned us in his post! Read the entire Chick tract parody below as well as our updated Chick tract parody. The tract was used to promote our mumblecore-style deadpan comedy film Ivy League Exorcist: The Bobby Jindal Story (watch the film online here). Read a theoretical discussion of memetics and semiotics regarding the way that the decontextualized portion of the tract became a meme. Check out our cool movie poster (it's a mashup of the movie posters for The Exorcist and Danger: Diabolik). Also, if you like the film, could you give us a rating on our IMDb page because Jindal partisans slammed the film with the IMDb ratings. Thanks. AUGUST 2012 UPDATE: Welcome Boing Boing readers! Read the Chick comic tract parody below and watch the short film Ivy League Exorcist: The Bobby Jindal Story on YouTube. Also, check out our production company web site. 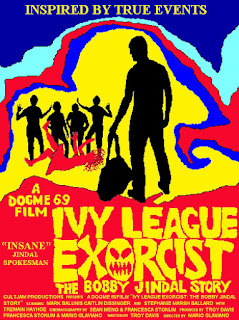 The site has a cool Ivy League Exorcist movie poster. We at CultJam Productions have some other film projects in the pipeline, so if you would like e-mail notifications of future flm releases or if you want to give CultJam Productions your feedback, contact us at cultjampro@gmail.com Also, to go to the front page of the blog, click here. Here is the parody of a Jack T. Chick tract that we gave out at Comic-Con last week. Click on a page to enlarge. AUGUST UPDATE: Mitt Romney picked Paul Ryan to be his running mate so the tract is a little dated now but still enjoyable. UPDATE 3: CultJam Productions created a new Chick tract parody called "Ivy League Exorcist." This new tract takes the basic idea of the tract below and adds new gags and the kind of things that Chick tract fans love. UPDATE 4: Click here an even newer version of the comic book with cameo appearances by Jesse Helms, Strom Thurmond, Osama bin Laden, and Sid Vicious. You can watch it on the CultJam Productions page . TROY DAVIS WROTE: This is the official movie poster. It is a mashup between the poster for the film The Exorcist and the poster for the 1968 film Danger:Diabolik. One of my friends said it was the best independent film poster he's seen.